... the sun doth bring to life. 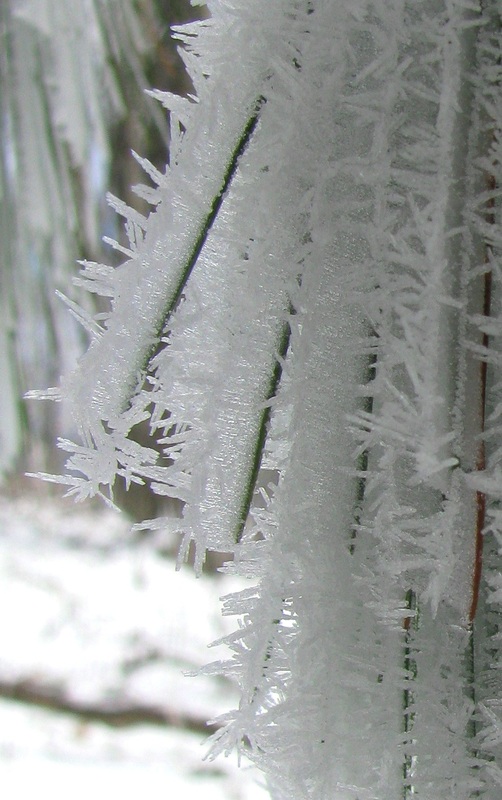 The high mountains of Northeast Tennessee were painted with a delicate coating of rime ice over the last 24 hours. The artist works her magic in a dim studio, downright dreary, closed off from the world in a private cocoon of fog - as if afraid to let anyone see lest the work be spoiled. It took all morning for the masterpiece to be unveiled. This was Day 37, February 9th, and the forecast was for sunshine. But up here in the mountains, it took its time coming. There was fog and still a little snow falling until after noon. I walked Cross Mountain, aptly named because it creates a connection by which the AT crosses from Holston Mountain, where I hiked yesterday, to Iron Mountain, where the shot above was taken. On Cross Mountain the AT features a 0.6 mile fully handicapped accessible length of trail that meanders through pastures to this sadly dreary vista of Shady Valley. Oh, how I wish I had been able to return there in the afternoon sun - but alas, a perfect world this is not. Still, I love the pasture walks. There's something elemental about them ... you sense an equality between earth and sky as you walk that thin boundary that separates them. It doesn't have to be sunny, but it helps that the fog had retreated to the higher ridges. And it was to one such ridge that I next traveled next - up over 4000 feet again to the spine of Iron Mountain. I've been viewing this very long linear ridge for what seems like weeks, but always from afar - always it was the next ridge over. Now I finally got to walk a bit of it. ... wait a minute, that's what AT thru-hikers do! I was reminded of that as I passed a kid this morning who could have been a distant relative of Nick Grindstaff. He was hiking north, stopped sitting on his pack smoking a cigarette. 'Cody Coyote' had very little to say. I only got his name from the register at Iron Mountain Shelter. But he seemed the quintessential example of a kid who'd rather be out in the wild alone, hiking forever, free of society's burdens. It was a beautiful setting - this place where I met Cody Coyote. I took a few close ups of the rime-ice artist's work, now just about finished - almost ready to be revealed. Rime ice can take many different forms, depending on the speed of the wind, the degree of 'super-saturation' of the air, and the temperature. Today's rendition is one that temperatures near freezing and light winds produce. And then the sun came out - literally the 'icing' on the cake that was today's hike. Not only did it bejewel the artist's work, it offered me a chance to climb up to the ridge at a power line clearing and see the wide world. In fact I could see all the way back to Mount Rogers and the high North Carolina peaks of the Blue Ridge - bringing back the wonderful memories of those clear days on high ground from a week ago. What a splendid time that was - and now here's another! There are so many memories being created - ones that I'll carry forever - this is why I'm out here. Here's the detailed map of today's route built from the GPS data I took. Click on the title for more detailed data and for a bunch of additional photos, each located at one of the red 'pins' on the map. Woulda ... Coulda ... Shoulda? ... Naahhh!